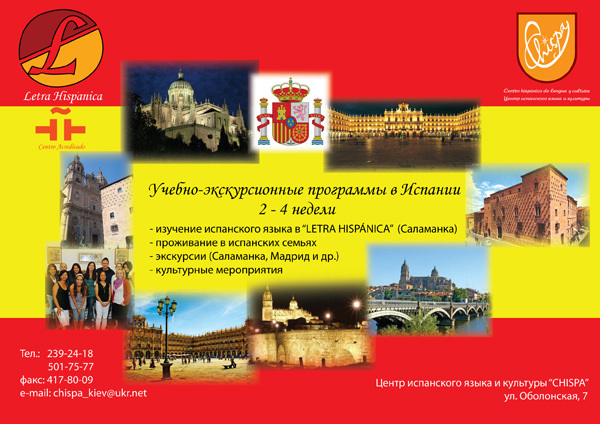 We cooperate with the language school "LETRA HISPÁNICA" that specializes in teaching Spanish to foreign students. "LETRA HISPÁNICA" is in Salamanca, one of the most prestigious university cities of Spain, with its centuries-old traditions. Salamanca entered in the list of the cultural heritage of UNESCO and in 2002 it was recognized as the leading cultural capital of Europe. This cosy and quiet city in the central part of Spain (212 km from Madrid) is famous for its hospitality. Students make up 40 per cent of the population of Salamanca. Doctors and Masters of Philology , qualified professors having a great deal of experience of teaching Spanish to the foreign students, work in "LETRA HISPÁNICA". But for the language skills, the courses in Spanish that are of different duration (from 2 weeks to one year), give the students the possibility to get acquainted with the culture, history, art and literature of the Spanish-speaking countries. The school conducts the tours, holds the nights of literature, the meetings with some interesting people, film forums and other cultural events.